Last week, Alfred Lin, the co-founder of Zappos and now a Partner at Sequoia Capital, came in to talk to the Front team about culture and customer centricity. I often hear companies in Silicon Valley touting some variation of being “customer centric” or “putting customers first.” Of course, we say that too at Front, but I hoped that the conversation with Alfred would help us crystallize what customer centricity means to us and why it’s important. He didn’t disappoint! While Alfred’s background is in B2C, his experience and advice is highly applicable to a B2B SaaS business like Front. At the end of the day, everyone using B2B software is a consumer too! Where B2B differs from B2C, however, is that we have many different audiences for which we need to create an amazing experience. A great experience for the enterprise software buyer may not be the best experience for the end user. Our challenge is to understand and empathize with each persona, making the experience exceptional for each. I can’t profess to have all the answers, nor do I believe that Front is perfect when it comes to customer centricity. But I do think we have some habits and elements of our culture that help us connect with our customers. So I thought I’d tell you why and how we do it. It makes everyone more efficient. This goes back to arming employees with an understanding of why they’re working on what they’re working on. You can eliminate a lot of confusion and back and forth by empowering everyone with a firm understanding of the customer and their problems. It helps ensure you’re making something people actually want. If you’re working in the San Francisco Bay Area and the vast majority of your employees are only connecting with people here, the products and services you deliver might not be meeting the needs and expectations of your customers who are elsewhere. Everyone does support. At Front, we didn’t have a dedicated support team for our first three years — we all took shifts doing it. Companies like Stripe, Zapier, and New Relic have all had similar “all-hands support” models at some point. 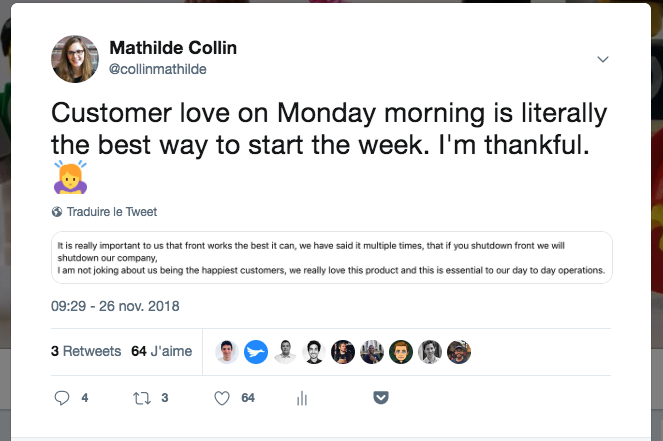 Today at Front, we set aside 30 minutes after All Hands each week when we encourage everyone in the company to hop into the support queue to help our customers out. You could also have every new hire spend a few weeks on support duty to help them get familiar with the product, understand common requests, and what goes into solving them. Leaders lead by example. You will often find myself and my co-founder in the support queue or on Twitter answering customer questions directly. I know Patrick Collison at Stripe and Eoghan McCabe at Intercom do this as well. Customer spotlights. Every week in All Hands, we highlight a customer, conversation, or deal of the week. We discuss the problems the customer faces and how Front is solving them. In these spotlights, we strive to really understand the unique situation of each team using Front and learn how our product can adapt to fit their needs. Make it easy for customers to share their suggestions. Since day one, our roadmap has been public. We encourage customers to let us know what features they want by posting and upvoting items on our roadmap. Customer feedback is easily accessible by everyone in the company. Too often, valuable customer feedback is buried in different places or never surfaced to the right teams. It’s in support messages, sales call notes, comments on your blog, Tweets and Facebook messages — the list goes on. With qualitative data so scattered, product teams often struggle making the most informed product decisions OR might overlook some critical information. To do this, you need one single source of truth for customer feedback. We of course use Front as our one tool where all feedback is collected, but you could also use Zendesk or JIRA. Share the good and the bad feedback with the team. Once a quarter, we ask our customers to take a NPS survey, where we ask for specific feedback about how we can improve. The results are collected in a shared inbox in Front, which everyone on the team has access to. This allows us to share not just the great feedback, but also the not-so-good feedback, which keeps the whole team realistic about where we are and where we need to be. Show customers we listen to them. We’ve set up a system so that when bugs are fixed or features are shipped, all customer messages with that bug or feature tagged are re-opened and assigned to staff who follow up letting the customer know that their request has been fulfilled. For the holidays this year, we decided to have a little fun with this and created videos about the latest features and improvements we’ve shipped. Follow along to see which customer wishes we grant. What do you do to build customer-centricity into your culture?